The Centre's extensive and experienced team of researchers and technical staff provides specialist consultancy services to industry via our world-class facilities, which include an advanced soil characterisation laboratory and two geotechnical centrifuges. Since its establishment in 1997, the Centre has developed extensive links with industry, providing technical expertise to exploration and petroleum companies around the world in all aspects of safe and economic foundation design and operation. COFS has endeavoured to ensure that its research is closely geared to industry needs, and as a consequence has focused increasingly on deep-water developments and geohazards. COFS has received an average of $4 million per annum for the last 5 years from industry for research projects. One such project was a three-year study on anchoring for deep water, sponsored by the American Petroleum Institute and Deepstar Consortium. Another two other collaborative projects related to soft sediment characterisation were undertaken with the Norwegian Geotechnical Institute. These were sponsored by eight major oil companies and six offshore site investigation contractors. COFS is a leader of the research activity within the InSafe and Safebuck Joint Industry Projects, and has ongoing collaboration with several leading offshore engineering research groups overseas. In addition, five members of COFS' current staff are members of either the American Petroleum Institute (API) or International Standards Organisation (ISO) committees responsible for developing international design guidelines for the oil and gas industry. There are numerous examples of COFS' research findings being codified in these API and ISO documents. 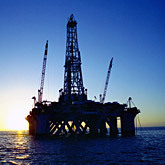 COFS hosts two industry funded Chairs, the Fugro Chair in Geotechnics and the Shell EMI Chair in Offshore Engineering.